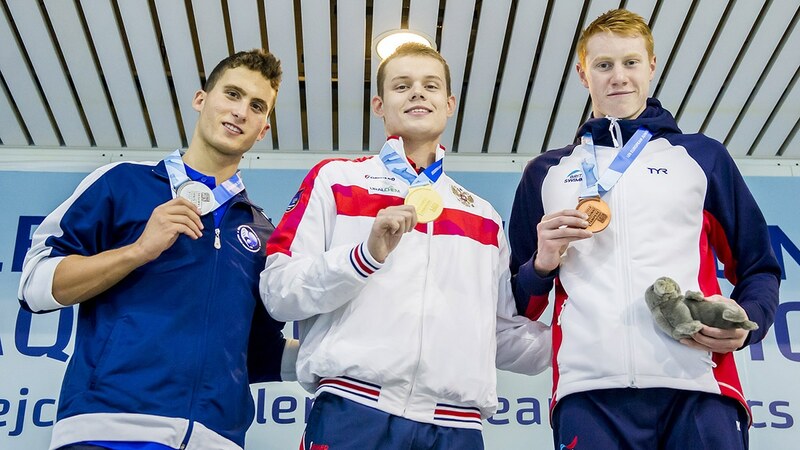 Great Britain’s youngsters finished third in the medal table at the European Junior Swimming Championships after winning two medals on the final day of the competition in Finland. Lewis Burras won bronze in the 50m Freestyle after clocking 22.69 – 0.42 seconds behind Sweden’s Bjoern Seeliger, who won gold, and only 0.08 adrift of Russia’s Kliment Kolesnikov (22.61). Tom Dean added to his medal tally with a bronze medal in the 400m Individual Medley in a personal best time of 4:18.07. Dean was fifth at the halfway stage but had moved up to third after 250m and held on to win his third medal of the competition. He was 1.28 seconds behind gold-medal winner Maksim Stupin, of Russia, who finished in 4:16.79. Charlie Hutchinson finished fifth for Great Britain in a time of 4:20.55. Dean also finished in seventh spot in the 200m Freestyle in 1:49.99. Freya Anderson finished fourth in the 50m Butterfly in 27.16, while the women’s 4x200m Freestyle relay team also had to settle for fourth place. Rachel Anderson (2:03.12), Laura McNab (2:03.26), Leah Crisp (2:03.53) and Anderson (1:56.52) clocked 8:06.93 as they finished 4.19 seconds behind winners Hungary (8:02.24). Katie Robertson’s time of 1:08.74 secured fifth spot in the 100m Breaststroke – 0.07 seconds ahead of her team-mate Tatiana Belonogoff who was sixth in 1:08.81. The men’s 4x100m Medley Relay team also finished fifth in 3:39.58. Nick Pyle (54.80), Archie Goodburn (1:02.82), Jacob Peters (52.85) and Burras (49.11) were exactly four seconds behind Russia, who took the gold medal. Lily Boseley was sixth in the 100m Backstroke in 1:02.22, while Goodburn came eighth in the 100m Breaststroke final in 1:03.49. Great Britain finished with a total of six gold, three silver and four bronze medals from their trip to Helsinki.